No matter what software one uses for post-processing photographs, the process of selecting what images to keep and work on, also known as “culling”, can be quite painful when dealing with thousands of images. And this gets even more painful when working with RAW images, because operating systems usually have no built-in capabilities to view and properly render RAW files. Many photographers end up keeping all RAW images on their computers, because they do not want to go through the hassle of deleting bad images they will never use, only to realize overtime that their hard drives get filled up quickly and their post-processing time takes much longer. Those who try to cull images in Lightroom know that if a full size image preview is not generated at the time of import, it can take a long time to render each image. Sadly, Lightroom is quite weak at quickly previewing images, so working pros and enthusiasts usually end up complementing the culling part of their workflow with additional software like Photo Mechanic. At $150, however, Photo Mechanic costs as much as a retail version of Lightroom, becoming a cost barrier for many. Enter FastRawViewer, an amazingly fast and truly inexpensive RAW file viewer that has become my personal choice for culling images. It was developed by the same folks that created RawDigger – one of the best scientific tools for analyzing RAW images. In this review, I will take a closer look at FastRawViewer, go through some of its features and hopefully help you in simplifying both your workflow and your photo backup / storage needs. FastRawViewer is a software utility for both PCs and Macs that is specifically designed for efficient viewing of RAW and DNG images. 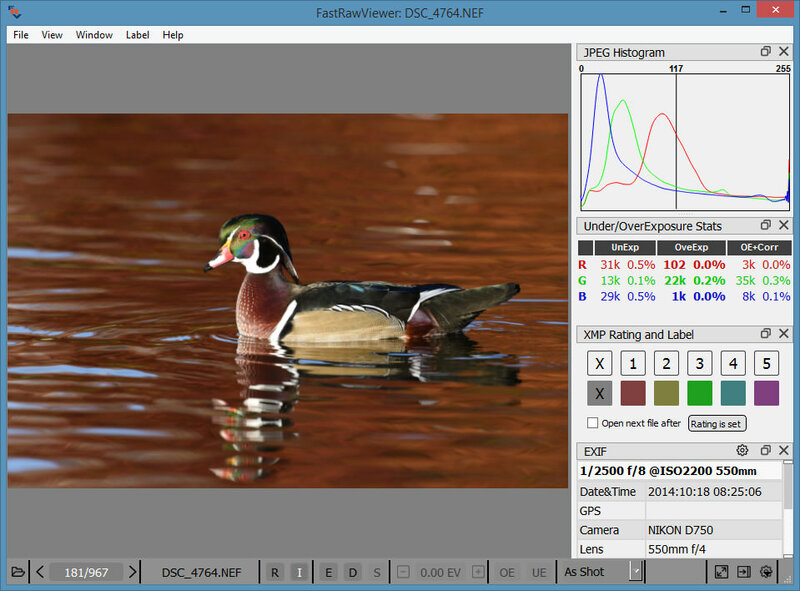 Whether the software is used for the culling part of the photography workflow process, for technical analysis or basic corrections, FastRawViewer is not only capable of opening RAW files from virtually every known digital camera, but it also does it at an incredibly fast speed, as the name implies. 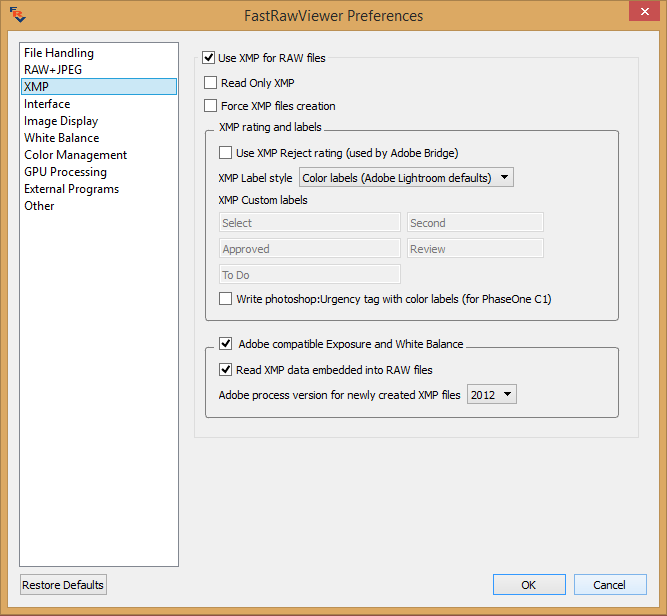 Unlike many RAW image viewers, FastRawViewer does not just read embedded JPEG images from RAW files, but it also renders RAW files as a normal RAW processor would (such as Adobe Camera RAW, Lightroom, Aperture, etc). 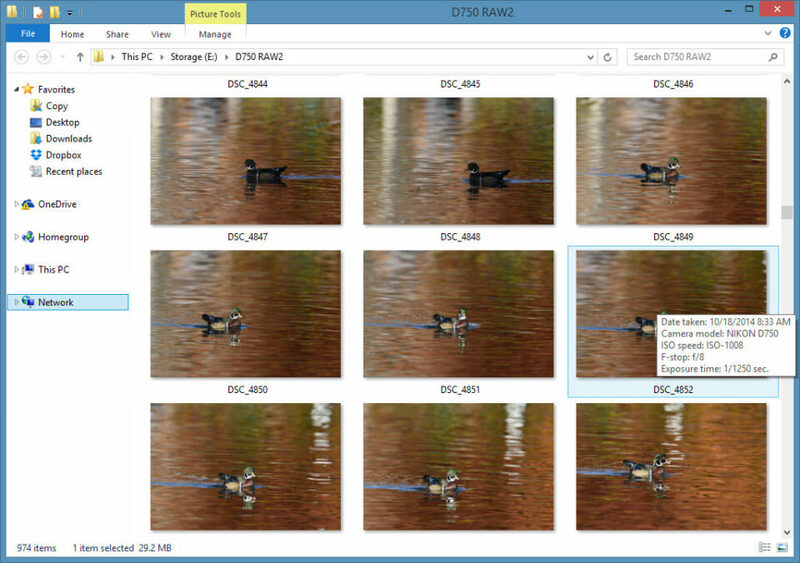 Being a non-destructive editor (meaning, it only reads RAW images and does not modify them in any way), FastRawViewer can be used effectively for picking, ranking keepers and discarding problematic images before they are imported into a photo catalog. After coming back from a photo shoot, one of the biggest problems many of us face is the sheer number of photographs that we end up with. When photographing weddings, photographers often average between 1500 and 3000 images, and those who photograph sports and wildlife can potentially end up with many more. Although the best practice is to shoot selectively and try to reduce the number of duplicates and problematic photographs in-camera, many of us run into time constraints and other issues, leaving the process of sorting through captured images for later. With such a large number of images, photographers often end up importing all RAW files into their photo libraries and either do the culling / clean-up process afterwards, or end up storing all photographs indefinitely. This not only increases the amount of time it takes to import and process images, but it also slows down backup and increases storage requirements, essentially decreasing the overall workflow efficiency. On top of this, post-processing software such as Lightroom and Aperture is far from being ideal for fast and efficient culling of images. Deleted photographs could still continue occupying space if not removed properly, and since photo catalogs utilize a database for storing information about images, it could get bloated overtime, if not properly optimized. In short, one would be much better off by reducing the number of images before they are inserted into a photo catalog. That’s where FastRawViewer comes to the rescue. Once the software is installed and it becomes the default RAW file opener in your operating system, you can use it to quickly view RAW images, delete unneeded / bad photographs and set ratings and labels right on your memory card or hard drive, so your post-processing software like Lightroom will be able to import and utilize the provided rating data. In essence, you end up with far fewer images to work on, which is always a good thing! What I personally love about LibRaw software like RawDigger and FastRawViewer, is that RAW support is provided way earlier than on any other software. For example, the support for the Nikon D750 RAW files was provided right after the camera came out, whereas I had to wait for a month for Adobe to release their DNG converter and another month to get the latest version of Lightroom to get proper support. In contrast, RawDigger and FastRawViewer already had the support for the camera pretty much as soon as it came out! That’s very important for me personally, because I get to use a lot of new hardware, so proper and fast RAW support is always welcome. 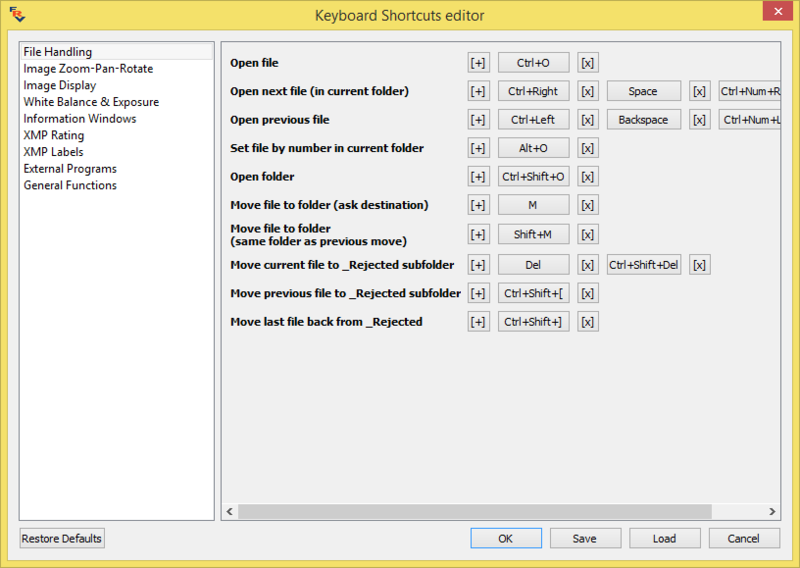 So you can customize keyboard shortcuts in a number of ways and even associate several keys for the same function. The main area obviously contains the rendered RAW image. To the right of the image, you see a panel that contains different sub-windows for the RAW histogram, Under/OverExposure Stats, XMP Rating and Label used for rating images and EXIF data. I personally prefer to keep these default sub-windows open, but if any of them distract you, you can simply click the “x” to the right of each one to turn it off, or visit the Window menu to toggle sub-windows on or off. Just like in Lightroom, pressing the “Tab” key will hide the panel completely, which is nice. If you prefer to see the sub-windows floated instead of attached to the panel, you can drag them out and customize them further for different opacity levels. It is not perfect yet, but I am working with LibRaw on making the EXIF screen even more useful. To test how well color management works, I fired up color-managed ACDsee Pro 8, Chrome and FastRawViewer and viewed the same image. It looked identical on all three, which is great news! As you can see, the results in the “after” screenshot are identical. Please keep in mind that the screenshots provided above are not very accurate, because calibration on your screen might differ from mine. With the screenshot, I wanted to provide consistency of displayed images, which is very important for a working professional. 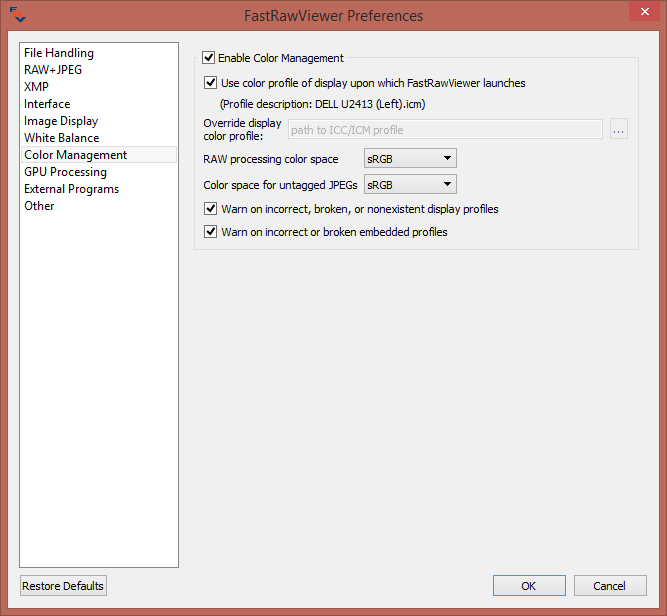 FastRawViewer comes with a boatload of options that you can tweak via the preferences window. There is a lot of information there and you can literally tweak almost everything, including how RAW + JPEG images are handled, how XMP sidecar files are created, how your GPU is used for resampling images, how images are displayed and much more! In this window, you can customize how your images are displayed when shooting RAW+JPEG. Instead of displaying two identical images (like most software would), FastRawViewer is smart enough to see that files were named identically and represent the same set, so you only get to see one image by default. If you do want to turn off this behavior, you easily can through the above preferences window. Lots of options here – you can even specify Adobe process version for reading XMP files! You get the idea – there is a lot to customize to suit your particular RAW and JPEG image viewing needs. Lastly, FastRawViewer automatically detects if you have Photoshop and Lightroom installed on your computer, so it can be set to open any RAW file in external software too. When you purchase FastRawViewer, you can install it on up to two computers with the same license key, similar to what you can do with Adobe Creative Cloud products. When it comes to upgrades, as it states in the purchase page, minor updates are always free and you receive free upgrades for major releases during the first 6 months from the date of purchase. Once the time window expires, you will receive a 40% discount on future upgrades. Some of our readers already know that I love ACDSee Pro for viewing images and making basic adjustments without going into Lightroom. I often show ACDSee screens on this site and I frequently talk about the image culling process during my workshops, where I show how I use ACDsee for viewing RAW images and deleting the blurry ones before they are imported into Lightroom. Although ACDSee Pro is great and capable software that could work as an alternative to Lightroom, paying $100 for just using it for viewing images might not sound very appealing. In that regard, FastRawViewer is the ideal choice, as it is solely created for just one task, instead of giving a huge list of image processing options. My biggest gripe with ACDSee Pro is that it is not updated regularly to support new cameras. For example, the last update for version 8 was released back in September and since then a number of new cameras have been released. When opening Nikon D750 RAW files, ACDSee shows a “format not recognized” error, while FastRawViewer has had the support for a while now. We are planning to review ACDsee Pro 8 separately, so if you have any interest in its image editing and file management capabilities, that will be covered in the upcoming review. While both FastRawViewer and Photo Mechanic provide somewhat similar functionality for viewing, rating and culling images, there are a few differences between the two. First of all, Photo Mechanic has been out for a long time, so its development cycle has gone through a lot of revisions and changes, making it a more mature product. It has been widely accepted as the platform for fast and efficient image workflow among many working professionals, so there is a huge endorsement of the software. As a result, it has a relatively large user base that at this point cannot be compared to FastRawViewer’s. Now this does not mean that FastRawViewer is bad or unstable – it just has not had been out as long, so it probably will be enhanced going forward with a lot more functionality that you do not see today to compete directly with Photo Mechanic. The first key difference between the two, is that FastRawViewer is only designed for viewing images, while Photo Mechanic has a lot of built-in tools for importing, renaming, tagging, organizing and editing images on your computer. So in a way, Photo Mechanic directly competes with Lightroom’s built-in file management tools. Some photographers use Photo Mechanic for those purposes and use Lightroom solely for editing, while I personally prefer to keep all organization of files within Lightroom, so the extra file management capabilities are not important for my particular needs. However, if you actively do use Photo Mechanic for file management and organization, then it is important to note that FastRawViewer does not do that. So if I needed to jump from one sequence to another, I can just double click on an image from the generated thumbnails and I am set. However, if your operating system cannot display RAW files, then Photo Mechanic’s thumbnail view can be very valuable. Similar to ACDSee Pro and Lightroom, RAW support from Photo Mechanic can take a little longer to become available, while FastRawViewer is almost immediate. And lastly, there is a huge cost difference – FastRawViewer is about 10x cheaper at the moment. There are other differences, but the above are probably the biggest. If you are looking for a way to improve and dramatically speed up your current workflow, I highly recommend to introduce FastRawViewer into your workflow as a RAW image viewer. It can be used effectively to cull through thousands of images to pick the ones that you will be storing, editing and backing up. It has a very small footprint, does not require a big learning curve and comes at a very low cost, making it a great solution for any photographer. In addition, its RAW support is always timely and the rendering of RAW files is immediate for very quick reviewing of captured images, something that cannot be said about Lightroom and most other image viewing software. I am happy to introduce FastRawViewer into my workflow and I am looking forward to seeing what our friends at LibRaw will be adding in future versions of the software. For limited time, you can get special introductory price of $14.99 for FastRawViewer ($19.99 regularly). You can purchase it directly through FastRawViewer website. Excellent review Nasim, as always. I have tried FastRawViewer and I find it to be amazing. Looks like it is worth the money and our support. Can’t wait for these folks to create an alternative to Adobe products. RawDigger is amazing as a scientific tool and FastRawViewer seems to complement it nicely. John, thank you for your feedback! Hey John, I would recommend giving BatchPhoto a shot. It’s a batch editing app with extensive support for RAW images. I can only presume the culling and quick previewing is something needed for Nikon shooters. I need to point out that Canon’s DPP opens and previews Canon RAW files insanely quickly, and has always been my go-to for precisely this filtering process. Don’t get me wrong, I am not questioning the great qualities and value of FRV. Being able to work with multiple brands is only of use for those who actually shoot several brands, but those are a definite minority. I know that I hated Lightroom (and PS Bridge) for its lethargic thumbnail and previewing as I first loaded a session shot in RAW, and soon realized that Canon’s DPP was lightning fast, loading all the images nearly instantly and allowing quick culling as you describe. I never actually edited anything with it, but I did all my culling exclusively with it, rating the images, and copying the ones I rated highest into a separate folder. It has a shortcut that selects all images of a minimum rating, which I then drag and drop to my ‘Filter’ sub-folder. The rest I would do within Adobe. I have no experience with Nikon, so it was not a criticism of it, merely speculation based on my knowledge that you are foremost a Nikon shooter. I was simply pointing out that as far as ultra-fast image loading and filtering was concerned, Canon’s body of users is well-served. You may discover that Canon cameras are systematically underexposing and Canon does not provide users with a tool to see it, and prevent it when necessary. There is a big difference between a histogram of a rendered raw and the histogram of the real raw data. I do not doubt it. I only use DPP to be able to filter my images for work, and they usually boil down to 2 grades: those that are keepers (4-star), and those that I plan to process (5-star). I do this fairly quickly, and if I have 2-3 images of a similar scene I cannot choose between, I send them all to the process (5-star) folder to choose later. Yep I love ViewNX. I personally think a lot of people never even think of the manufacturers software as they automatically think it’s going to be inferior. Capture NX2 certainly does work with the D810. The D810 comes with Capture NX-D software which is integrated with Capture NX-2. It is a great combination. I have processed tens of thousands of images from my D810 with Capture NX-2. I have the whole Nik suite as well, but rarely use it. 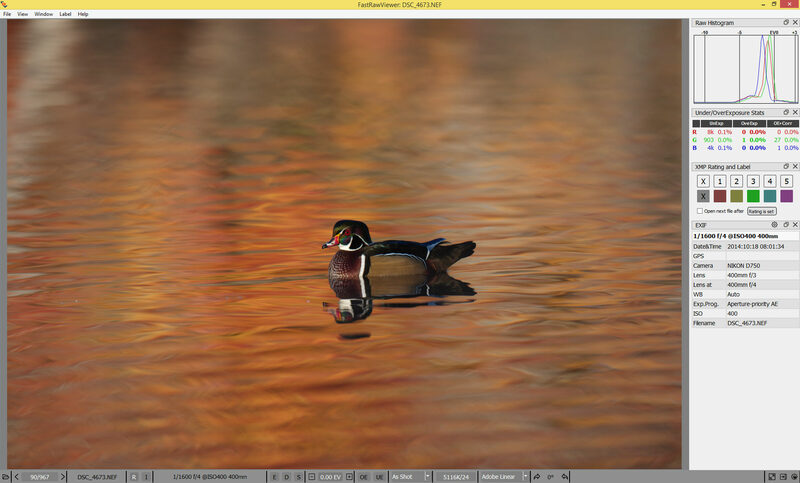 Capture NX-2 does such a great job … It is the best Darkroom Replacement software I have used. This does look like an excellent option. The price alone makes it worthwhile. I have however already invested in Photo Mechanic. Moving away from a database program (both Aperture and Lightroom use their own collection or library as a key feature) involves some changes in workflow. I now have a first import section folder (with sub folders). I now use PhotoMechanic to sort, compare, tag and select photos. I can then move the selected images to a different folder (with sub-folders). It means I have a clear distinction in the status of the images and which ones to back up etc. 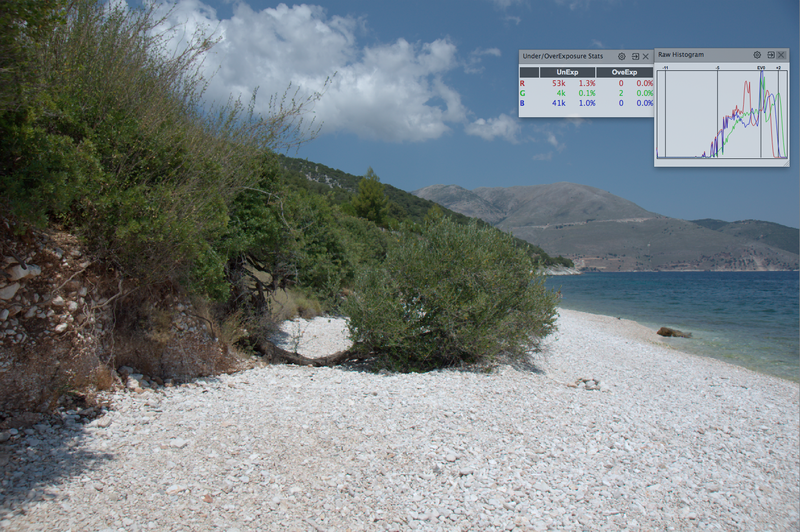 While I think PhotoMechanic is worth every penny, I think that Fast Raw Viewer looks like brilliant value for money. Having got used to the speed of PhotoMechanic it seems unlikely that I will ever go back to a program like Lightroom or Aperture (which has no future anyway) for organising images. I sincerely hope these guys do not get bought out before they create their own image processing software. Not only is this incredible fast processing, but also accurate to what I expect the colors to be! I actually prefer their processing to both capture one and adobe, and the speed of it is just incredible! I hope so too! Great to hear that you are enjoying the software. wow! You are easily convinced dude……someone come up with a viewing program and suddenly you declare it better than a decade old experience of capture one and adobe! You must be related to the founder here. I have not stated that they can fully take on Adobe/Capture One right now, and I use both of them. Capture One has color adjustments second to none and adobe has better organization. However, this companies program is fast and efficient, I would like to see that speed in an image processor. Hell, I would be glad to just have tiff/jpeg output out of their current program. You must be comparing to some 10 year old Canon bodies. On those bodies, I fully agree with you. But as I won’t pay MSRP for canon 1D today, I find it senseless to over rate a apsc body that look about the same with that machine. Go see if you could challenge Nikon D750 for example. 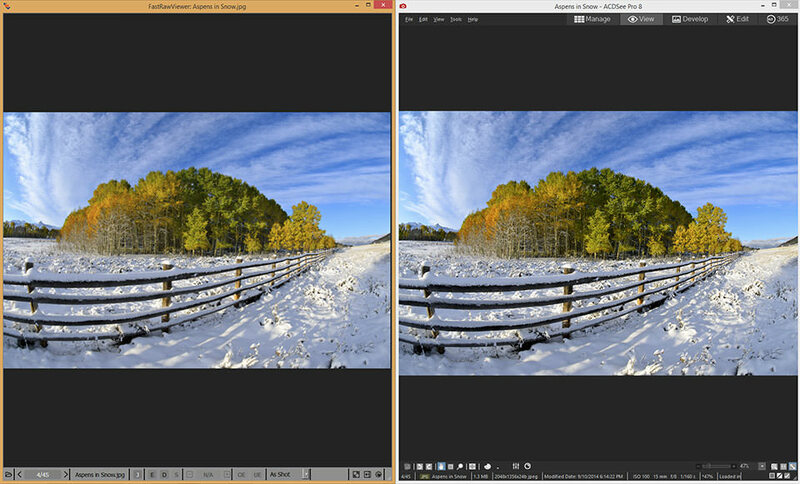 Dpreview and imaging-resources both provide very good comparison tools. How well does it support Fuji RAW files? After reading your 5.7 LR review, I’m reluctant to upgrade, or at least I started to think of alternatives. For the initial selection process (X-ing files in LR) this might seem to be a good option, then I’ll have a more limited selection of RAWs in LR. Fuji RAWs open very fast on my machine. No problems! I read your article last night and after having the same frustrations as others with Lightroom in not being able to adequately preview my photographs with a large image size and not having any tools to select images before I import them, I found this product quite useful and well worth the under $15.00 price. I especially like the large image viewing size and being able to click on a button to see if any shadow details or highlights are blown out. The histogram is also great. It takes Lightroom forever to render a histogram, and I have a fast PC. FastRawViewer has what Lightroom has been missing, and for about $15.00, you can’t go wrong. It is a great product for the money. I am shooting with a Nikon D800 currently. I plan to review my collection of old images and cull out the ones I should have deleted long ago. Great job in reviewing this product. I agree, thank you for your feedback Peter! Great software with a great potential, absolutely worth supporting in my opinion. Thanks! Looks like a must-buy. 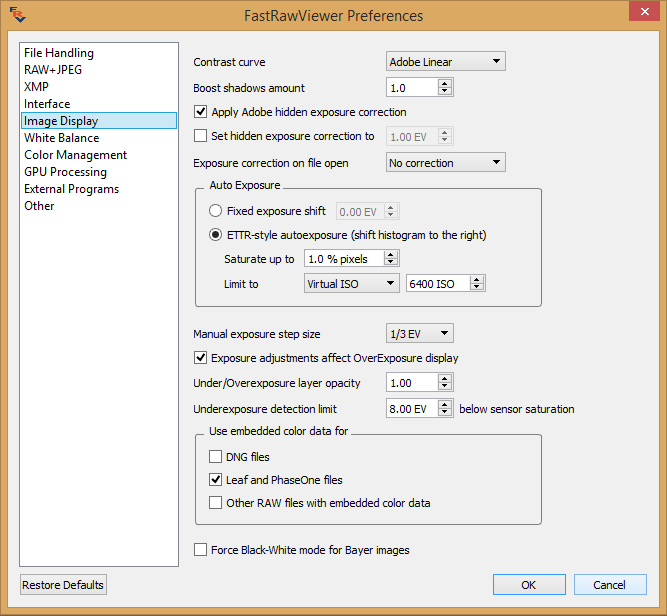 Can you open individual LR images directly into FastRawViewer to use that products RAW/Histogram assessment tools? Save the 15 DLLs. And use the sofwear that came with your camera, it does the same for free (like Nikon viewnx). Have to say the comparison shot of this viewer with the ACDC software was not identical at all – the former was far more saturated and brighter. To say my monitor is not calibrated the same doesn’t answer it, since the images are side by side on the same monitor. Assuming the use is fast review and rating for PP that would show up in Lightroom or something similar, choosing from and rating six or ten RAW shots on the basis of some different color management output would potentially waste a lot of the user’s time and effort. Albin, did you move the slider to see what “after” monitor calibration looked like? :) I think you are looking at “before”, which obviously looks very different. Thanks for reply, just got back to this – I see that if I drag far left the the two look identical but at far right they are as I described. The labels confused me but the reliable fast viewer could well facilitate quick and dirty ratings and boost workflow. One might like to see this efficient functionality as a “preview” feature in full powered software rather than a separate, free-standing software. Thanks for the head’s up on this software. Been using ACDSee Pro for years and have Pro 8. I can’t see how in the world ACDSee can call themselves “Pro” software when their updates are about once a year and can’t even view new camera RAW files. I’ve contacted them repeatedly and they always come up with excuses. 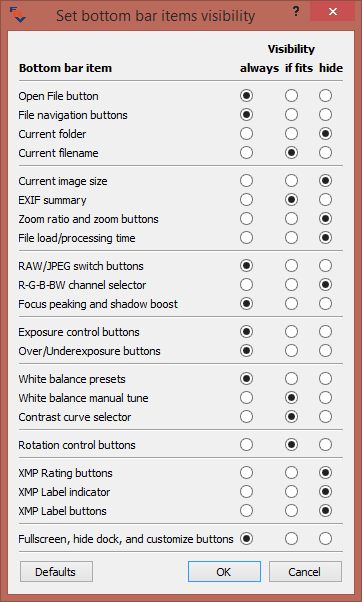 i have to use FastStone for my RAW D750 viewer, but now there is another option. I wish more people would contact ACDSee and complain. Thanks Nasim. As always I enjoy reading your articles! If you “just” want to go through your RAW files for filtrering, I’m having hard time to convince myself to buy this software. Sure, it’s a lot more capable than Windows’ RAW codec, but again… Viewing RAWs one by one? No idea about Windows but OS X does render the RAW files, to view just use PREVIEW. Using LIGHTROOM or APERTURE on the Mac the full size image preview can be generated during import: just select the option in »Preferences/Preview« for APERTURE or »Preferences/File handling« for LIGHTROOM. Browsing in both programs will be fast. Preview does not handle raw files from many cameras. Having never used any other software for my Nikon camera, I have a few questions. Do the images go straight into FVR from the memory card? After culling, do I just import from what’s left into Lightroom? Finally, since I’m going to try ViewNX first, is it the same process for culling and importing into Lightroom as it is for FVR? 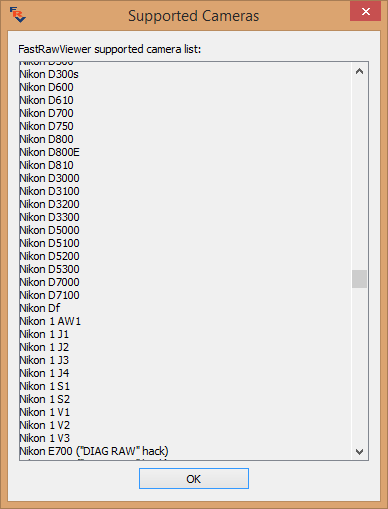 Crap, I forget what ViewNX…oh, yeah, software for Nikon cameras! Well, I haven’t yet tried ViewNX, but I understand that since people complain about Lightroom being slow for initial culling, and that Nikon’s software is fast for such, I’d give it a try (I don’t shoot a lot, however, so it’s really not that big of a deal). Anyway, I don’t want to do any post-production in either ViewNX or FVR. I want to do all that in Lightroom. Looks like a very capable program. I have used FastPictureViewerProfessional going on over 6-7 years now. If you have never seen it you can find it here. www.fastpictureviewer.com. It is very fast, robust and they update the program constantly. It looks like it does everything that FastRawViewer does and then some. I’d be interested what you think of the program. 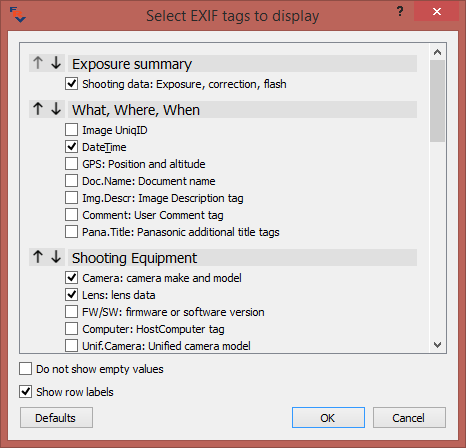 FastPictureViewer displays the embedded jpeg file, i.e., it records the cameras picture mode settings. Is this a plus or a negative I do not know. Because the program reviewed here displays what it interprets as the raw file, open it in LR, DXO, or C1 and what they interpret as “raw” untouched will differ greatly. I bought it and it looks like it will dethrone fastpictureviewer as my new culler. thanks for the link. I did download trial of FRV, but I have to say that it didn’t impress me that much for basic/initial picture culling. For that I find FastPictureViewer superior, using the whole screen for the picture. Zooming to 100% view on left mouse and 200% on right mouse as default, then skipping back and forth blazingly fast with arrow keys while keeping the mouse button depressed for checking sharpness, press “X” on the ones to be deleted and then ctrl+X when done with the folder to delete the marked ones – brilliant and fast. I can’t say anything about the histogram and colours, but my install if FastPictureViewer has the exact same colors as PS and Qimage. The features you describe re zoom, navigation, and sharpness assessment are present in FastRawViewer, please look thorough Preferences and Keyboard shortcuts. On top of that FastRawViewer has focus peaking indicators. The program you refer to shows embedded or external JPEGs, and if that is all one needs to see than of course any viewer is OK.
Jepp, fast culling for sharpness and layout is basically what I need and for that I found FastPictureViewer faster and better than anyone else I’ve tried for that (and that has been a few over the years). It also fits brilliantly into my DAM workflow. I believe this is the beauty of having choices. You like FRV better and I like FPV better and we use the one that fits the best into our workflows. This is also what is great with sites like this that we get informed about stuff we might not know of, either from the article itself or from the comments below. Sometimes it’s just what we are looking for being cameras, software or accessories. Dear Nasim, looks like a very useful program, but i have been using the free Microsoft Camera Codec Pack for ‘culling’ which allows windows user to open and view RAW images in windows inbuilt programs such as photo viewer just like jpeg, have you used this program before? It is so amazing still to me how someone can take 3-5k of pictures in a single setting? You can tell the digital from the film guys for sure. I am trying so hard to use the 8 frames per second amazing delivery of my K-3, but can’t seem to keep my finger on the trigger. I photographed two powerhouse high school football teams in the DFW area last weekend. I swore I would “let it rip”! Got a lot of shots of the now “Gatorade Player of the Year”, Kyler Murray, but when I got home, I just had 150 shots! I can’t go back to this historic game, but I did get some good images that were carefully anticipated. But I’m trying! Maybe next football season, I can shoot a few hundred more frames! $15 for this software is more than reasonable. I use Nikon, Sony and Olympus cameras so very useful for a ‘quick view’ and culling those photos that don’t make the grade. Would have been nice though to have a simple ‘Delete’ (from disk) button on the bottom or side toolbar though – and a better way to navigate through directories (perhaps incorporate a left toolbar for this). Perhaps Illiah will consider this. I’ve been using this software for about 2 weeks now and I can say that I like the cleanliness of the user interface and the overall look and feel of it. The image is big and the info bar on the right side is very useful and gives you the most important data that any photographer needs. Some other programs are often cluttered and it’s hard to find data that really matters to you. I have a question regarding the RAW files: Why are different apps showing the same RAW file differently? So far I can say that the way Picasa opens the RAW files is the most pleasing to my eye. I don’t know what do you think about it? This was a very helpful article, Nasim. 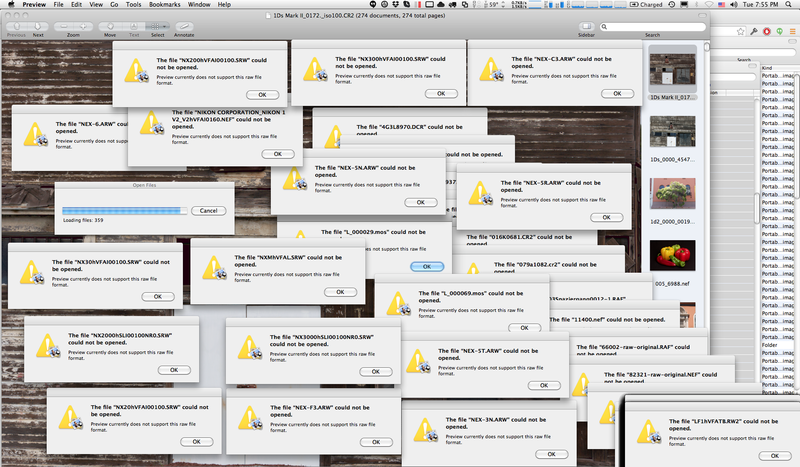 I just got back from vacation and desperately need a faster way to cull through my 2000+ RAWs than lightroom. This software is exactly what I was looking for – it is FAST on my Mac Mini. Just purchased a license. Hi Nasim. I am a bit late reading this – as usual! But I do hope you see this question soon. If I use this software to read my old collection of pictures this are already in Lightroom, will it pick up the rating, colour coding, tagging info? This would be of real help because culling is top priority for me just now. If any software will help me reduce my pictures to a manageable number, I am happy to try it! But if I lose the existing information I have fed in – albeit into a very few chosen pictures, it will really put to waste all the hours I have already put in. And also what about the actual changes I have made – cropping, adjustments, etc.? Will it also pick up tif files that have got created using software such as silver fx pro? Thanks and regards. And what about the Nikon Viewer. Normally when I download my photos I select them using the Nikon Viewer. Hi There – Quick question if I can – I waiting to purchase this program. IS it faster than Photo Mechanic – I fine photo Mechanic obscenely slow at rendering RAW files, I can not work with it any more becasue of this – my macs finder renders the images far far quicker!! Photo Mecanic have been unable to offer any advice to improve the situation other than try viewing the embeded jpegs which frankly defeats the object. So whats your take on the speed comparison? After downloading trial it looks like it is a great tool but for different type of culling compared to Photo Mechanic. PM is still faster as it uses JPG preview (AFAIK) and great for coming through _thousands_ of event photos to pick hundreds for finishing. FRW is great to see if _hundreds_ of your staged photos (say, posed wedding shots) are sharp, facial expression is good and no unrecoverable exposure errors made. You can also try KrojamSoft PhotoViewerPro. It’s a simple but powerful photo-viewer app. After reading your FastRawViewer review I downloaded the trial version. Even after reading the manufacturers histogram explanation I still had problems understanding this histogram after using ACR. I gathered that EV0 was 18% mid grey so +3 was three stops brighter. Using a D800 I find that the headroom of a NEF is better than Three stops and could not equate that with this histogram. The focus display fine details and contrast edges, how accurate is this? I normally use Nikons View NX and mouse click on an area to see at 100%, its quick and accurate and having viewed the eyes for example st 100% I feel confident about the image. I do like the idea of viewing an accurate RAW histogram so I would like this software to give me confidence. I then sent a request for help from the website but after some time there has been no reply, rather disappointed at this service. Thanks for this great suggestion. It (almost) enables the workflow that I was hoping to achieve. I have a small question that will significantly improve the process. Is it possible to move all rejected raw files to the rejected subfolder, instead of doing this one by one. What I want to do is to rate certain photos in my folder as reject and then once I have gone through all the photos, I would like to filter such that I only have all the ‘reject’ photos in the filmstrip (This much is currently possible in FRV). Finally, I would like to select all (something like ctrl+A in windows) and move these photos to Rejected subfolder. I am not able to do this last part. The only way is seemingly to do this file by file, which I think is unnecessarily tedious. I shall be glad if you know a way to achieve this. Thanks once again for suggesting this brilliant software. I just emailed FRV tech the same question about selecting and copying/moving multiple images. My other issue is that when I select raw files to copy/move into a Favorites ‘Keepers’ folder, the creation date and modification dates become the same date that I ‘processed’ this. I am hoping that there is a solution this issue. At least in the current version of FRV, ctrl+A (I suspect; Command-A on a Mac) selects all, then in the Select/Batch menu, “Move to _Rejected” is right there. Nasim, looks like a great program. However, I am looking for a program that creates a contact sheet from a directory on which I can tag (number and/or color code) the images I want, and then copy each numbered or color-coded group of files to another directory where I can work on them in Photoshop. I don’t use Lightroom. The copied file would include the JPEG and RAW file. Ideally, it would be similar to Photo Mechanic which simply doesn’t work on my new computer. Thanks in advance for your help. I would like to know if anyone has used or preferred DxO Optics Pro Elite or Capture One Pro software over the Adobe Products ? I’m looking for something like Lightroom but not as advanced as Photoshop. Nice review. Good descriptions of the user interface, and how to customize it to ones needs. Wish you would have spent some (more) time on describing how you actually use FRV in your workflow, What FRV tools do you use? Which ones are too slow/cumbersome/technical when confronted with 100’s of images to cull? How do you use the info provided by FRV? A follow-up review covering these items would be of value. Thank you Nasim for introducing FRV and publishing such helpful insight. Great work! I hope the folks at LibRaw create a 3 to 5 minute video of simply selecting and culling photos with it. Currently one has to wade through a lot of information (YouTube videos and PDF guide) to learn that most significant action. Most of us want to just get to work, and at a later date learn more. Need one small information: Does FRV has the option to directly mark the labels on the RAW file and not on a side car files. I know that option is available in VIEW NX2 and Photo Mechanic. I paid with BreezeBrowser by PayPal two weeks ago and have sent an e-mail to the company twice, and they never replied. I have no key code and the evaluation period has ended. Now the software does not work. Peter, what is BreezeBrowser and what does it have to do with FastRAWViewer? Excellent recommendation! Having stopped Adobe’s subscription, I am in need of tools to import and cull photos. Exposure X3 was on my list but the price made me hesitate. I wanted to see reviews of other tools here at Photography Life before I jumped in. Very glad that I waited. FastRawViewer lets me cull images and look at photos in a way that I haven’t before (Focus Peaking and Details!). On Windows 10, I also needed a way to import photos. Am trying Photo & Video Import app by Axel Rietschin (they have a fast raw viewer too that I haven’t tried yet). Will give myself some time with FastRawViewer but one evening with it has got me really excited. Thank you. Most excellent recommendation on this software. It is fast and efficient that allow me to cull through several memory cards in the same evening, before it uploaded them into Lightroom. I like the most is the ability to adjust exposure quickly before I do the RAW conversion. Overall I am much less frustrated with Lightroom while getting my photos processed enjoyably! Users of DXO Photolab: star rating by Fast Raw Reviewer is not recognized by Photolab. PL is my favorite website for photography and I really enjoy your and your team’s effort to educate me and the rest of the community to be better photographer. What I really am looking for is reviews of alternate software to Adobe Lightroom. Some time ago I read you will start this. I can not stand Adobe any longer with their new prescription policy. What about a reviewing On1photo raw and other stand alone software?